Sauromalus ater is a large, flat-bodied lizard with a large rounded belly, and a wide-based blunt-tipped tail. The neck and sides of the body are covered with loose folds of skin. Their scales are small and granular. They are the second largest lizard native to the United States. Sauromalus ater coloration can vary greatly from locale to locale. In most adult males, the head, shoulder, and pelvic regions are black while the mid-body can range from red, orange, cream, white, black, brown with varying amounts of speckling. Since chuckwallas are active lizards, they require spacious cages. For 1 adult chuckwalla, we recommend a cage with at 1.4 least square meters (4.5 square feet) of floor space. If using a glass aquarium, the minimum size for 1 adult is a 40 gallon breeder (0.9 x 0.45 meters (3 x 1.5 feet)). A pair of adults can be housed in a 75 gallon aquarium (1.2 x 0.45 meters (4 x 1.5 feet)) Adult males are territorial, so only one male per cage is recommended. Some babies may be raised in a small group, but close attention should be paid to ensure that all are eating well and growing at close to the same rate. Animals should be removed from the group if they are overly aggressive or overly passive. The minimum size we would recommend for 1 or 3 hatchlings would be a 20 gallon long (0.3 x 0.75 meters (1 x 2.5 feet)). If such an aquarium is selected, keep in mind that the babies will likely outgrow this small cage in less than 6 months. We use 50 gallon plastic storage tubs made of opaque plastic. Rocks make the best basking sites and hiding spots. We use and recommend real rocks for chuckwalla cages. Minimally, we will use one rock for basking and a few rocks for hide spots. The basking rock(s) can just be a large chunk of rock, or a stack of flat rocks, as long as it is an elevated spot. We use flat sandstone/ flagstone for hiding spots. We use aquarium silicone to adhere “legs” to each of the pieces of flagstone, so that each piece is like a little table. These “tables” are then stacked one on top of another. This will give the chuckwallas their preferred hide spots; rock cracks. Also, any rock placed in the tank should be placed directly on the cage bottom, so that lizards will not be able to dig under them. Chuckwallas can also be crushed this way. We have always used play sand as a substrate, and have had no problems with it. We apply about an inch deep layer evenly along the bottom of the cage. We do not recommend using calcium and / or vitamin sand. We like to keep it simple, and use only play sand, which can also be found at the hardware store. This substrate should be spot cleaned every day if possible; removing any feces, urates, and uneaten food. Although, we have found it easier to keep baby chuckwallas on a paper substrate for their first year of life as babies are more susceptible to becoming impacted from loose substrates. Using paper as a substrate also makes for a much quicker clean up. As chuckwallas are diurnal (active during the day), lighting is extremely important. We put our lights on electric timers, and give the lizards about 10 to 12 hours of light each day. We use halogen flood bulbs as the heat lights on our cages. These should be placed above the basking rock and aimed at the highest point of the rock when possible. Basking temperatures in our cages range from 43 ºC (110 ºF) to about 55 ºC (130 ºF) on the basking surface. Babies should have a basking site on the cooler end of this range. We have observed wild chuckwallas basking when the rock temperatures are in excess of ºC (120 ºF). The cooler end of the cage should be anywhere 29-31 ºC (84-88 ºF). Over this end of the cage, we place a UVB light. Good quality UVB lighting is highly recommended. We use high output (HO) T-5 fluorescent lights with at least 10.0% UVB. It is important to monitor cage temperatures multiple times throughout the year to ensure that your cage will remain a good environment for your lizard(s) as the seasons change. Most of the water they need is received from eating the fresh vegetables. Gravid females, females that recently laid eggs and babies have a higher need for additional water, and should get a dish or have water dripped onto a flat rock in their cage 2-3 times a week. It is important to ensure that the cage substrate does not become wet or damp for extended periods of time. This can lead to a buildup of fungus or harmful bacteria in the cage. So don’t drip excessive amounts of water into the cage. Standing water in a shallow dish can be offered to adults once or twice a week. Relatively low (15%-65%) ideally, though they will tolerate higher humidity at times. In a desert terrarium humidity can be difficult to acquire and maintain, but offering a slightly humid hide would be one option. Chuckwallas are mainly herbivores, though they may eat some insects occasionally. In the wild they eat every day, so in captivity fresh food should be available every day as well. We feed our chuckwallas a diet that is composed mainly of dark leafy greens like kale, collard greens, chard, mustard greens, escarole, curly endive and dandelion greens. Parsley and cilantro are also used occasionally. We chop or shred the greens into pieces small enough for the lizards to swallow without having to tear the leaves too much themselves as they tend to eat more if it is easier for them to just sit and eat. Sometimes we mix finely ground Zoo Med brand grassland tortoise pellet food and mix it into the somewhat damp greens at least a few hours before the greens are to be used. This gives the ground tortoise food enough time to become slightly moist. We use about ¼ cup of the ground pellets for each bundle of greens, and mix well. Zoo Med brand grassland tortoise pellet food is primarily made of grasses, and other raw plant matter. As the Zoo Med brand tortoise pellets are largely composed of raw, high fiber plant matter, they are a great source of dietary fiber. This is part of our effort to make our captive diet closer to what wild chuckwallas would get (high fiber, low water content). We have noticed several benefits to adding this source of fiber to their diet. We also offer 2 types of dry commercial food pellets, Rep-Cal Juvenile Iguana food and Mazuri Herbivorous Reptile LS Diet-Small. Seeds such as millet and lentils can be offered. Two to three times a week we add some (thawed) frozen vegetables (any combination of peas, green beans, carrots and rarely lima beans, and corn) onto the greens. Finely shredded squash, such as : acorn, spaghetti, yellow or butternut can also be offered occasionally as can finely shredded carrot sweet potato or parnsips This diet has worked well for us, and it has kept our lizards fat and happy. We use and strongly recommend Sticky Tongue Farms brand Miner-All (make sure that you use the indoor formula). We also use Repashy supplements like SuperPig, SuperVeggie, and SuperVite. These are used in rotation a few times a week. We also supplement their food with bee pollen, especially in the spring. A calcium supplement without D3 should only be used on animals housed outdoors. Babies get the same leafy greens as the adults, but they are chopped up into much finer pieces. To reduce the risk of impaction, babies don’t get the frozen/thawed veggies until they are between 6-12 months old, then they are gradually worked into the diet. Most captive chuckwallas will become tame with regular, gentle handling. Hand feeding, and allowing animals to climb on your hands is a good way to start the taming process. Many captives will have somewhat runny feces. These can accumulate on the scales on the under side of the tail and legs. Chuckwallas should be soaked monthly, and cleaned with a soft bristled brush such as a toothbrush to remove the stuck on feces. Spot cleaning the cage daily to weekly is best as feces will accumulate quickly. And we recommend replacing their substrate and scrubbing down the cage completely every 4-6 months. Common chuckwallas tend to shed in patches, usually taking several weeks to completely shed (sometimes longer). Juveniles shed much more frequently than adults. Without direct contact to unfiltered natural sunlight for most of the day, chuckwallas do not absorb enough calcium from their food. 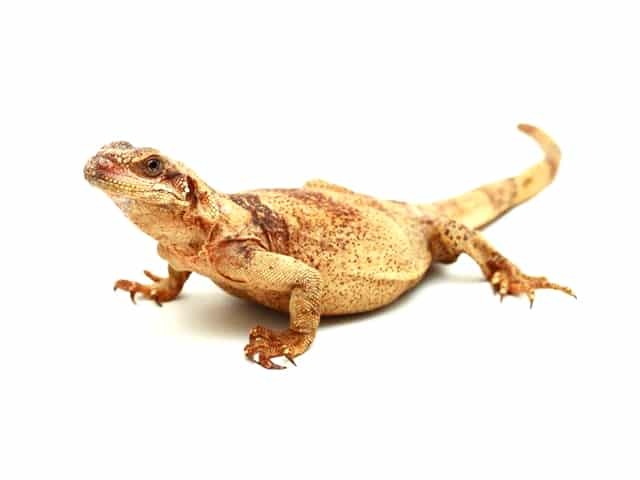 This can lead to one of the most common ailments for captive lizards; Metabolic Bone Disease. When lizards don’t get enough calcium, their bones start to degrade. This can cause loss of appetite, lethargy, debilitation, and death. Usually by the time symptoms appear, the condition has advanced to a point where the lizard will suffer permanent damage, if it even survives. This is why it is important to add calcium with D3 to their food at least 3-4 times a week and use a good quality UVB light.